You must be a member of the Singapore Dolce Vita Group to attend this activity. Would you like to join this group? 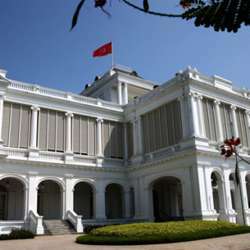 The Istana grounds will be open to the public on Feb 6 from 8.30am to 6pm in celebration of Chinese New Year, the President's Office announced on Tuesday (Jan 29). In commemoration of the Istana's 150th anniversary, President Halimah Yacob will also launch the exclusive Istana Protected content Series during the open house, according to the press release. The series is a collaboration between Istana and Singapore Mint, and comprises silver medallions and FlashPay cards bearing significant features of the Istana, as well as the architecture of buildings located within the Istana compound. Those who purchase from the series on launch day will receive an exclusive certificate. Other Istana open house highlights include lion dance, Chinese dance and wushu performances. Visitors may also try their hand at Chinese calligraphy and sign up for the nature guided walk and Istana guided tour, which allows visitors to view selected function rooms and the collections of state gifts presented to the president and prime minister. The open house is free for all Singaporeans and permanent residents. There is a S$2 entrance fee for other visitors.